Dr. Christensen's research interests are in molecular biology and biotechnology, liver diseases, and functional genomics of eukaryotic cells. Dr. Christensen teaches the following courses: Cell Structure and Function (Biol 213), Biotechnology and Genetic Engineering (Biol 385), General Genetics ( Biol 311) and, in the past, Recombinant DNA: Techniques and Applications (Biol 575). 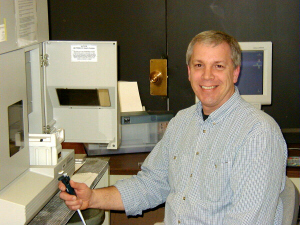 Dr. Christensen is an Associate Professor in the Molecular and Microbiology Department and is the Director of the undergraduate concentration in Biotechnology in the Biology BS degree. Students pursuing a B.S. in Biology may choose to obtain a concentration in biotechnology. A selection of lecture and laboratory courses provides essential skills to students seeking employment in the field or who desire graduate work in this area. Interested in Biotechnology as a career? Last update: This site is continuously under construction!